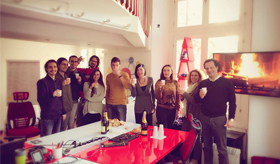 SPX Lab wishes everyone merry Christmas and happy holidays, hoping next year will be full of joy and satisfaction. For the creation of the new Me The Selfie Machine website, which will be online soon, the members of our team, professionals from different backgrounds, all participated to a workshop applying the UX methodology, or User Experience Design, which is about mapping the personas, or the potential target of customers and their needs, and based on these informations extrapolating the flow of navigation of the portal and its structure. 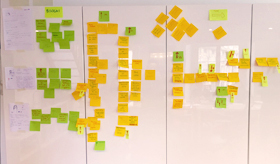 A process where creativity and methodology merge to ensure that added value to the users' experience. Contemporary society faces the pressing influence of new technologies, it’s a reality that leads to an escalating need for simple and intuitive solutions to respond to changes; we rely on the UX methodology, or User Experience Design, to build effective web solutions in order to improve user satisfaction and simplify usability, accessibility and interaction with our products. Last night we were in Livorno, at the Lusben Exclusive Xmas Party gala evening held in the Benetti Yacht headquarters. We were guests of the event in order to present Auleum with TaBi, the magical surface which recognizing the product to the touch tells its story and features by immersing the spectators in a suggestive atmosphere of sounds and visual games. 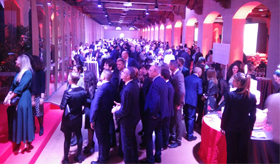 A prestigious event in which we had the opportunity to celebrate Italian excellence once again. Me The Selfie Machine, the promotion and marketing tool, is enjoying great success by establishing itself as an icon of Smart Retail, thanks to its customizable features and the intuitive and effective use that involves and abducts users. Among the latest results we count the collaboration with MoodArt, the Fashion School based in Verona, which chose Me to promote its courses to the Job & Orienta event; and the Italian fashion brand Terranova from the Teddy chain, in collaboration with Empresa Creativa, which wanted to permanently install Me The Selfie Machine inside its first Concept Store: the 'Terranova Island', a space dedicated to the entertainment of consumers and the training of the administrative staff, inaugurated last December 8th at the Terranova Store in Pesaro. 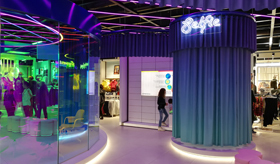 Me The Selfie Machine aims to involve users in a fun and interactive experience, yet focusing on the needs of the brand, allowing to collect useful data for new marketing campaigns. We are proud to announce a new collaboration with H-Farm, in partnership with two other leading Italian companies in the high-tech sector: we will inaugurate an innovative War Room: a Conference Room 2.0, for the second half of December. We will keep you updated on the development of the project. On November 14th the Ambassador of Vietnam, who was in Genoa fulfilling representative duties, wanted to pay homage to SPX Lab since he couldn't attend the Gold Event Experience held in Hanoi. 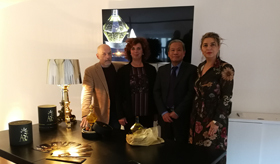 Right before visiting the Mayor of Genoa Marco Bucci and the President of the Liguria region Giovanni Toti, the Vietnamese ambassador was received by our company during the opening day of the Open Week to show him our creative laboratory and our products. Following the excitement for Tabi's performance at the presentation of Auleum , the Vietnamese authority showed interests for our other products, such as Me The Selfie Machine. This visit confirms the consensus reached in Vietnam, a crossroads of success between the genoese technological avant-garde and the Ligurian food project. From November 13th to November 17th SPX LAB opens its doors to the public and offers the opportunity to know the company, its products, and their functions. It will be possible to discover innovative tools such as Me The Selfie Machine, that lets you take selfies and share them in order to boost engagement on social networks and gather useful data to pinpoint potential targets for future marketing campaigns, and Ta.Bi, the interactive surface which recognizes the product by just touching it and describes features and history throughout video, sounds, and images; a real sensory experience through which you can expose your own product. To attend the event, you need to make an appointment by sending an email at info@spxlab.com indicating the day you prefer. 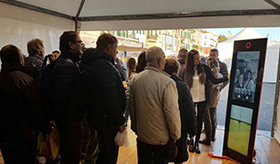 SPX LAB announces a new successful collaboration: from November 10th to November 12th Me The Selfie Machine was at Olioliva Imperia 2017, the event which promotes the Ligurian agro-food excellence. The event counted hundreds of visitors who wanted to witness their presence by taking a photo and participating in the contest launched for the occasion "Sei Olio? Sei Oliva? "; an initiative that has gathered over three hundred shots and more than a thousand likes and sharing on social networks. The presence of Me was fundamental: succeeding in engaging participants and amusing adults and children, Me has created visibility and engagement on social networks with a total coverage of 30,000 people on the event page, transforming visitors into the testimonial of one of the main events for promotion of the Ligurian territory and its products. On November 10th, the pharmaceutical company Abiogen Pharma held an event in partnership with Aristea to celebrate the company's twenty years, choosing our product Me The Selfie Machine to entertain more than three hundred guests. 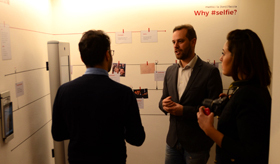 The event recorded an average of fifty clicks per hour: guests could capture their presence by taking a selfie and bringing home their own photo, thanks to the instant printing option. Me The Selfie Machine, a powerful marketing tool, it's declinable perfectly for all kinds of celebrations, setting itself as the perfect entertainment to propose during your events. For the "Gold Experience Event" event in Hanoi, SPX Lab was partner of Auleum, The Golden Oil and ambassador of Italian excellence and creativity. 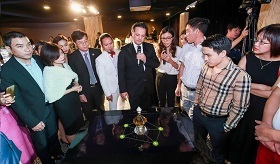 This inaugural evening, which celebrates the launch on the South-East Asian market of this luxurious product, was held in the magnificent PT Casa showroom. The magic of Auleum conqueres overseas: the table, with its completely Italian design, fascinated the illustrious guests of the event. 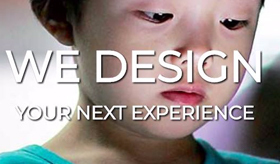 Ta.bi integrates an innovative object recognition system that gives the user an unforgettable experience. From today SPX Lab and Genoa are officially in Vietnam.